Please don’t be frighten to see me teaching you this expression. It is not that I got aggressive all of the sudden LOL. I write this lesson to answer a question I got from a YouTube viewer. I shared this question on my Facebook page at http://www.facebook.com/learnthaiwithmod , and I got many people to help me with the answer. There are many ways to express “get the hell away from me” in Thai. เลย [leoi] is a particle used when you tell someone to do something immediately. Now, this one sounds very harsh and impolite. ซะ [sá] is a particle used in a command. So this expression is telling someone to go to die. 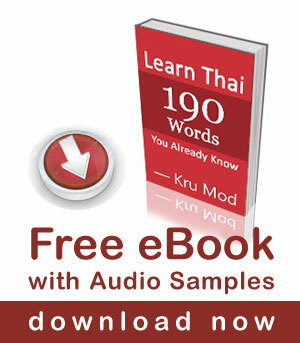 We use the word นึก [núek] when you misunderstand and want to say “I thought ….”. This verb has to always use with the word ว่า “wâa” (that). Well, I hope you enjoyed the lesson and have learned something new. I think it’s best to always be polite with katoeys. I’ve seen pissed off katoeys beat farang men to pulp after being rudely spurned. Ok, thanks Mod for the warning. Response number 3 seems to me to best express the level of impoliteness in the original question. It’s rude, but not vulgar. If I chose response  should I try to be even more impolite and say กู นึกว่า มัน เป็นผู้หญิง ?